Straw flowers were used by the Egyptians to decorate the statues of their gods. Greeks used straw flowers mixed with honey to soothe burns and in the Victorian era ladies would decorate their homes with lovely arrangements. 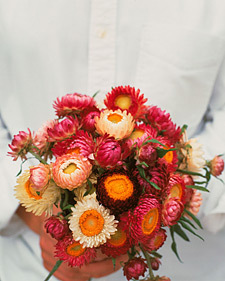 The lovely red, yellow, orange, pink, white or purple colors make them ideal for beautiful, colorful arrangements. Straw Flowers can be planted from seed indoors in March or outdoors after all danger of frost is past. If the middle part of the flower is broken in half, it will reveal the seeds, which can be planted again. One of the least demanding plants to grow, straw flowers thrives in poor, well-drained soils with little attention. If you like to make your own indoor flower arrangements harvest the flowers by cutting them for drying before their yellow centers are visible. Take off all the leaves. Wrap the stems with a rubber band and hang them upside down in a dry, airy, shaded place. It takes about two to three weeks for the flowers to dry.